Imagine you just received a heads-up. From January, your salary will be credited to a bank account your employer recently opened for you. But you do not know the details of this bank account and have no idea when you will find out. The news also is that from now on your parents can withdraw their monthly pensions by walking to the new ATM recently set up in front of their house. But every other time you or they try, the ATM says the PIN you have does not match. No one can tell with certainty when your new bank account will accept your claims or you given PINs that work – it could be weeks, or it could be some months next year. This is the disarray the UPA government will put lakhs of rural households into if it goes ahead with its “game-changer” plan to shift beneficiaries to Aaadhaar-Enabled Cash Transfers (AECTs) for welfare payments in 51 districts starting January, when it is scrambling to scale this even in pilot blocks. Jharkhand is one of the states where pilots for AECT for payments of MNREGA wages began in December 2011 in 12 blocks in four districts – Ranchi, Ramgarh, Hazaribagh, Saraikela-Kharsawan. Of these, in one block in Ramgarh district, the government has started AECTs pilots in pensions (Old Age, Widows, Disability pensions), scholarships, Kisan Credit Cards, and Indira Awaas Yojana as well. But visits to two of the four pilots districts show that a vast majority of beneficiaries still do not have the requisite bank accounts mapped with 12-digit Aadhaar numbers. Or they have ‘PINs’, in this instance their individual biometrics of their fingerprints, which do not work when they try to get paid via the new ATMs – their village Banking Correspondent who disburses the cash once the biometrics are matched with the UIDAI’s databases through a hand-held device/a micro-ATM. According to the minutes of the first meeting of the executive committee on Direct Cash Transfers in the PMO on 9 November to discuss these “seamless transfers of cash,” secretaries of over 10 ministries concluded that “the tipping point for rolling out AECTs would be an Aadhaar penetration level of 80 percent of beneficiaries.” Minister for Rural Development Jairam Ramesh in an article in The Hindu on December 11, 2012 also emphasized the prerequisite of 80 percent of each district’s population having an Aadhaar number and Aadhaar-enabled bank account before payments are started. In Ramgarh district adjoining Ranchi, from where a live telecast of Aadhaar-enabled payment of MNREGA wages was streamed at a function organized by the Congress in Dudu near Jaipur on October 20 and which had been identified for full coverage by UIDAI for Aadhaar enrolment, enrolment is at less than 40 percent of the population of over 9 lakh. The number of Adhaar-mapped accounts is 18,883, i.e., less than two percent of the district population. When Jharkhand was chosen for pilots to pay MNREGA wages through AECTs last December, in an interview to the Economic Times Assistant Director General at UIDAI’s office in Ranchi PK Upadhayay had said that they planned to pay 174,000 MNREGA workers through this. A year later, officials in UIDAI’s office in Ranchi admit that this figure stands at 5000 – less than 3 percent of the initial target. The pilots have failed to scale up and give little indication of what to expect in the rollout announced for January. In Ramgarh, a majority of the beneficiaries are in Dohakatu and Marar panchayats in Ramgarh block. 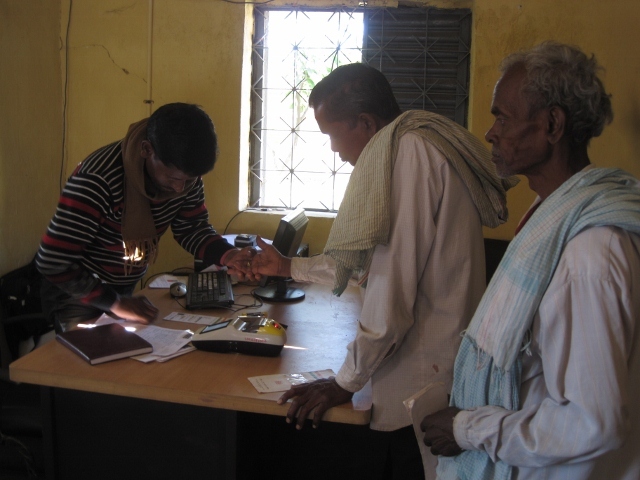 Over 63,000 people enrolled for Aaadhar numbers in the two panchayats in Ramgarh block. Of these, only 2312 were “mapped” i.e., their Aadhaar numbers and their welfare details linked together. Of 4791 “active” job-card holders in the two panchayats, only 469 received MNREGA payments through AECTs. Fifty kms away in Ratu block in Ranchi, of 8231 “active” job-card holders in three panchayats, those paid through AECTs is even lower: 162. “In the first phase of enrolment there were not enough machines. Also, in Ranchi district one of the agencies Vision Comptech Intergrator Ltd. tried to rush through enrolment by showing many people as having no fingers and captured only their iris. They misused a guideline that allows capturing of one biometric if the other is of poor quality,” revealed an official at UIDAI’s district office requesting anonymity. Arvind Prasad Deputy Director General at UIDAI’s Ranchi office confirmed that the company was asked to “update” biometrics in over 5000 such cases in Ranchi district which they finished doing only last month. Amitabh Kaushal District Collector Ramgarh who has been awarded the National Aadhaar Governance Award two years in a row admits that the district’s administrative capacity is under strain and banks are not able to cope with the volume of transactions. Of eight banks on the Aaadhaar platform, five got added only last month. In Ramgarh and Ranchi, all accounts have so far been linked with the service area bank, Bank of India. “Initially many people turned up to enrol without their MNREGA job-cards. So now we have to physically go house to house to find every job card holder. In some places there was high enrolment but no BOI branch, in other places a branch existed but little enrolment,” says Mr Kaushal. He rattles off a list of other concerns – bank technology upgradation, internet connectivity in hilly areas, and availability, security and integrity of the cash-carrying Banking Correspondents (BCs). At the panchayat bhawan at Dohaketu where most of the MNREGA payments recorded were made, the BC Rajesh Kumar tries to rush through filling beneficiaries’ bank forms online – he has been asked to submit them by December 15 – but runs into many interruptions. “The line (power) came back only at noon. Last week two days there was no power and then there were server problems,” he says. But at 3 pm, when he begins making payments to those who have queued up to collect wages for land-levelling work done in MNREGA in November, there is anxiety but palpable excitement too. Of the seven workers who take turns to scan their fingers, the micro-ATM Mr. Kumar operates recognizes four’s. He pays them between Rs 300-200 from the cash he withdrew at the bank that morning. For two workers the micro-ATM lists errors repeatedly. One worker’s account has still not been mapped. Of four pension beneficiaries who turn up, three collect their payments within an hour. Dashay Bediya, a frail agricultural worker in a white shirt and dhoti, tries eight times placing different fingers in the hope that one will work and then goes outside the office and scrubs his hands. He returns and tries five times more getting more anxious and disappointed each time. “Come after 3-4 days. Put Vaseline or Boroplus and rub your fingers before you go to sleep,” Rajesh instructs him before sending him back. And so the question, can the ease of payments at the household or panchayat level not be better achieved through smart cards that require neither real-time internet connectivity, nor the creation of a massive centralised database like UIDAI’s that is harder to include those who missed enrolment the first time to? Dohakatu has had such a bevy of bureaucrats, officials, journalists visiting for months that the sarpanch Kalawati Devi now keeps a stock of mineral water bottles at the panchayat bhawan. At the site of the second pilot 50 kms away in Ratu block, however, things have not gone so smoothly even during officials’ visits. A few days before October 2 when the Chief Secretary Jharkhand was to hand over pensions through AECTs at a function at Tigra panchayat, block officials and BCs tried frantically to make the fingerprints verification go through for 45 beneficiaries. It worked only in the case of nine. Since October 2, even these nine have not been paid through AECTs even once, their payments still going to their old post-office accounts. The only reason they are still able to get their pensions, however, is because the government has kept the additional option open to withdraw the money at the post-office using their old passbooks. “Half of MNREGA workers’ fingerprints do not match. Maybe their fingerprints keep changing? In March I gave pension beneficiaries ID proofs to BOI so they open accounts and give passbooks. Then the bank manager changed in June and bank officials say they lost the documents. I gave the documents again in September but everyone is still waiting for passbooks,” says Tulsi Koeri the BC in Puriyo panchayat, Ranchi. In Tigra panchayat nearby, the BC Mahmood Alam says of 383 whose MREGA accounts were mapped with Aadhaar since last December, only 102 have got passbooks making it difficult for them to withdraw wages if they run into authentication or internet connectivity problems. Neither Mr. Koeri, nor Mr. Alam has been paid their monthly salary of Rs 2100 since they were hired as BCs last November by United Telecoms Limited (UTL) that BOI outsourced the work to. Rajesh Kumar Ramgarh’s BC got paid for four months after the Collector Mr Kaushal intervened in June. Even he has not been paid the last six months. “I spend at least Rs 400 per month on fuel for this work. In October at the PM’s video conference three of us were sent from Ratu, we paid over Rs 2 lakh those three days. There have been 18-20 functions with officials from Delhi, Bangalore, even America. But if I ask for wages, UTL says if you do not like the work you can quit. Could you ask them about our wages please?” asks Mr Koeri. An edited version was published in The Hindu on 15 December here and here. A Hindi translation of the op-ed here on Right to Food Campaign’s website. After the Supreme Court ruling that Aadhaar membership is not mandatory for accessing benefits, a follow-up report on thousands of students in Jharkhand government schools who missed enrolling for the scheme, and are unable to get scholarships.